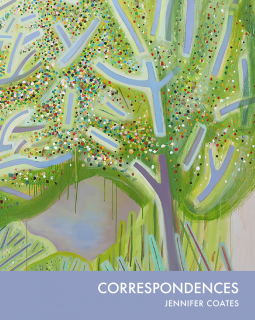 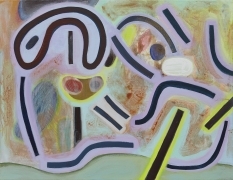 Freight + Volume is excited to announce Correspondences, an exhibition of new paintings by Jennifer Coates. 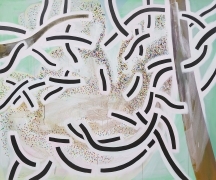 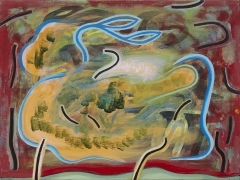 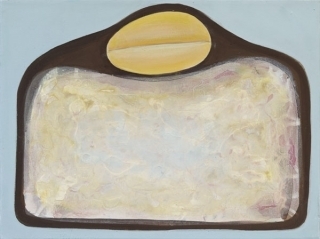 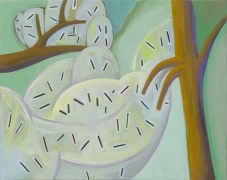 Diverging from her food-centered paintings, spotlighted in her previous solo exhibition at the gallery, All U Can Eat, her new works feature abstracted landscapes grounded in an engagement with early modernism and an exploration of color relationships. 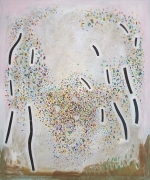 The paintings on display began as an accumulation of pen and colored pencil drawings, driven by Coates' fascination with the ways in which the brain "imposes itself onto the world around us" and seeks out order in chaos. 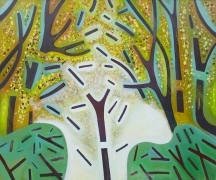 Developing and refining motifs drawn from nature into the stylized, kaleidoscopic forms that populate her canvases, Coates balances the immediacy of observation with the depth of a sophisticated artistic practice. 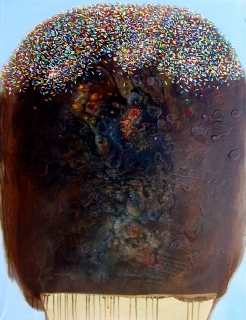 Contrasting tightly controlled passages with oozing stains and spills, her attention to the materiality of paint lends her a work an almost visceral physicality, reminiscent of hallucinatory, psychedelic states and the phenomenon of closed-eye visuals. 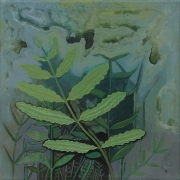 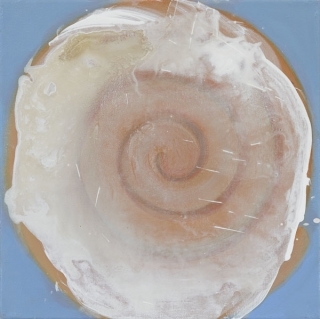 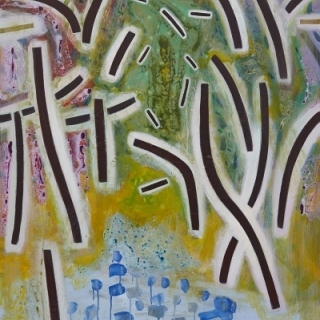 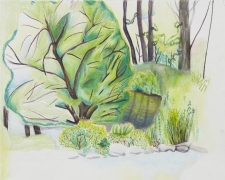 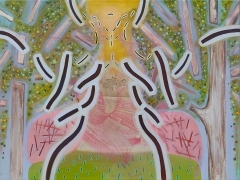 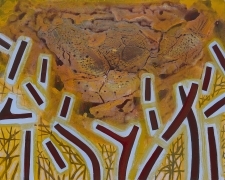 These visual qualities reflect her interest in synthesizing the natural world with lived experience and the contingencies of modern life, dissolving the barriers between the organic and synthetic. 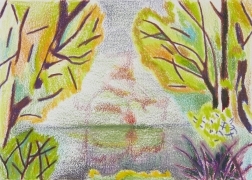 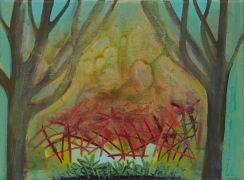 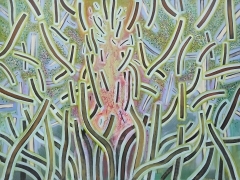 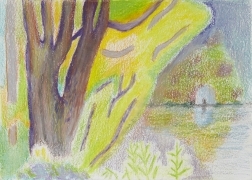 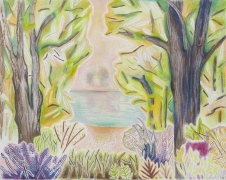 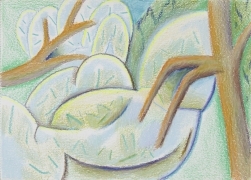 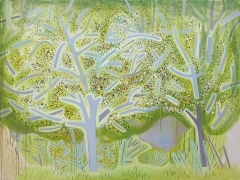 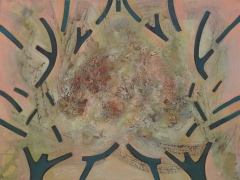 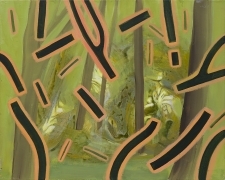 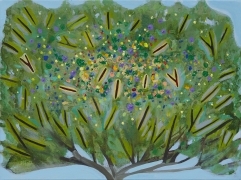 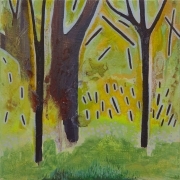 Coates finds an analogy for this facet of her practice in Charles Baudelaire’s poem “Correspondences”: “Nature is a temple in which living pillars / Sometimes give voice to confused words; / Man passes there through forests of symbols / Which look at him with understanding eyes.” The pigments used in Spring Trees and Meadow, for example, originate in modern chemical processes, though they are deployed in the representation of bucolic natural scenes. 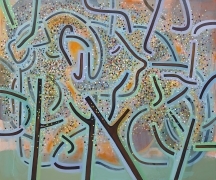 Coates' radiant palette imparts a surreal quality to the works, and the shifting balance of color harmonies and tensions bears its own momentum, intertwined with the fragmented compositions of the paintings. 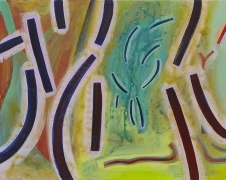 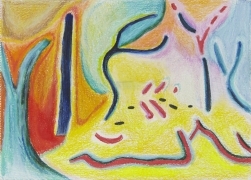 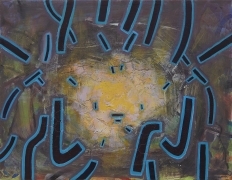 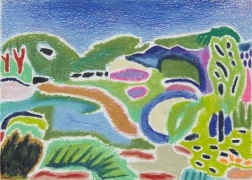 The work of early Modernist painters such as Matisse, Kandinsky, and Klee, amongst others, and their absorption of the teachings of mystic writers has a palpable impact on Coates' paintings of natural subjects; and the influence of Mondrian, especially his refracted abstractions of trees, is particularly embedded in Correspondences. 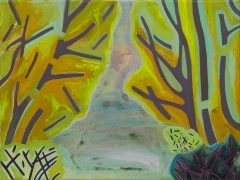 Treading the line between seemingly metaphysical abstraction and an exaltation of paint's physicality, Coates' work offers a visionary take on the natural world and the landscape, broadening its parameters and expanding its allusive potential. 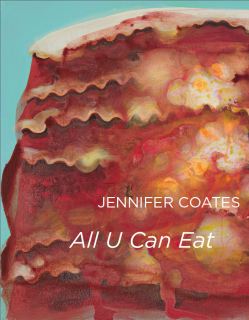 Jennifer Coates has exhibited her work widely, including an an upcoming two-person show with Caroline Chandler in May 2018 at Crush Curatorial, a solo show, Carb Load, at the Pennsylvania Academy of Fine Arts (2016), and All U Can Eat at Freight+Volume (2017). 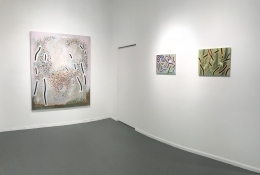 She had a two-person show with David Humphrey at Arts+Leisure in 2015 and at Fiendish Plots in Lincoln, Nebraska in April of 2017, along with a group show, The Secret Life of Plants, at Freight+Volume (2017). 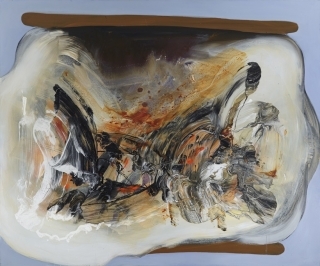 She has written art reviews for Time Out New York, Art in America, andThe Brooklyn Rail, and recently published her first article, “The Goo of Paint,” for Modern Painters. 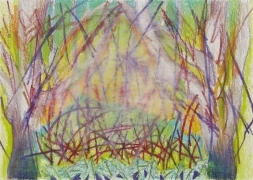 She also plays violin, ukulele and sings with various bands around NYC. 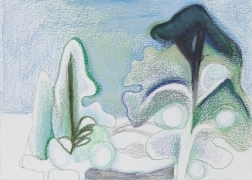 A full-color, limited edition book has been published to accompany the exhibition. 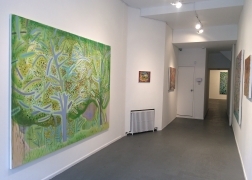 For more information, contact nick@freightandvolume.com, or call 212.691.7700. 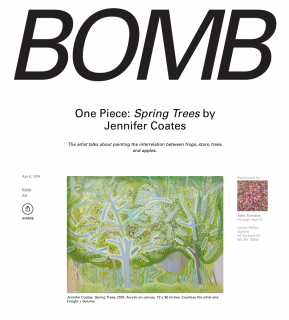 "Beer with a Painter: Jennifer Coates" Jennifer Samet discusses with Jennifer Coates her show at Freight+Volume "All U Can Eat"
"Conversation: Jennifer Coates and EJ Hauser at PAFA"